I decided to try out the eye pencils from MUA and I'm so glad I did. At only £1.00 each I now want all the shades. 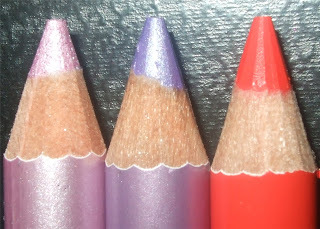 The pencil design is just like ELF's Shimmer Eye Liners but not as flimsy and more of a higher quality. I picked out 3 colours, two which are Intense Colour finishes (Lovely Lilac, Bright Orange) and the other Intense Glitter (Pink Sparkle). 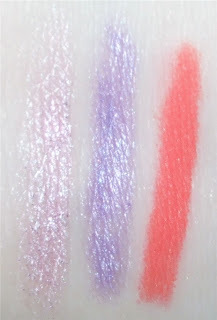 Compared to ELF's they are quite a bit longer in length and actually more pigmented. All are very creamy and pigmented, they glide on with ease. I don't think I can fault these at all, being only £1.00! The only problem is that with creamy liners you have to sharpen them more often, but I guess that counts for Urban Decay's 24/7 pencils too. I have all of these except the black and white and I think they're excellent for a pound. The Malted Chocolate and I think it's Jungle Green are really lovely - and the orange is fun too! I really need to get some of the brightly coloured ones!